The tall, gangly man twists a cone of paper in his hands as stories from nearly 30 years of addiction pour out: the robbery that landed him in prison at age 17; never getting his high school equivalency diploma; going through the horrors of detox, maybe 40 times, including this latest bout, which he finished two weeks ago. He’s now in a residential treatment unit for at least 30 days. Santiago has reason to worry. Data on opioid addiction in his home state of Massachusetts show the overdose death rate for Latinos there has doubled in three years, growing at twice the rates of non-Hispanic whites and non-Hispanic blacks. Opioid overdose deaths among Latinos are surging nationwide as well. 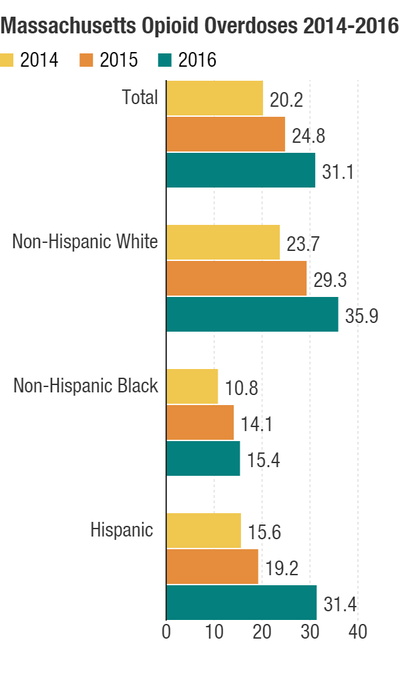 While the overall death toll is still higher for whites, it’s increasing faster for Latinos and blacks, according to data from the Centers for Disease Control and Prevention. 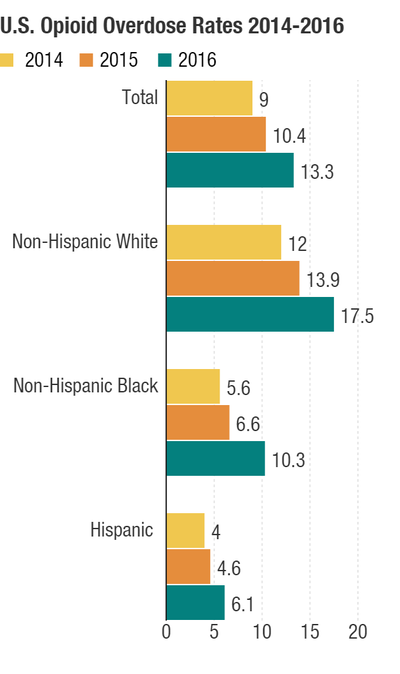 Latino fatalities increased 52.5 percent from 2014 to 2016, compared with 45.8 percent for whites alone. (Statisticians say Hispanic overdose counts are typically underestimated.) The most substantial hike was among blacks: 83.9 percent. The data portray a changing face of the opioid epidemic. There’s little understanding about why overdose deaths are rising faster among blacks and Latinos than whites. Some physicians and outreach workers suspect the infiltration of fentanyl into cocaine is driving up fatalities among blacks. The picture of what’s happening among Latinos has been murky, but interviews with nearly two dozen current and former drug users and their family members, addiction treatment providers and physicians reveal that language and cultural barriers, even fear of deportation, could limit the access of Latinos to lifesaving treatment. Irma Bermudez, 43, describes herself as a “grateful recovering addict.” She’s living in the women’s residential unit at Casa Esperanza, a collection of day treatment, residential programs and transitional housing in Boston’s Roxbury neighborhood. Bermudez said the language barrier keeps anyone who can’t read English out of treatment from the start, as they try to decipher websites or brochures that advertise options. If they call a number on the screen or walk into an office, “there’s no translation — we’re not going to get nothing out of it,” Bermudez said. Some of the Latinos interviewed for this story described sitting through group counseling sessions, part of virtually every treatment program, and not being able to follow much, if any, of the conversation. They recalled waiting for a translator to arrive for their individual appointment with a doctor or counselor and missing the session when the translator is late or doesn’t show up at all. SAMHSA, the federal Substance Abuse and Mental Health Services Administration, maintains a Find Treatment website that includes listings of treatment offered in Spanish. But several Massachusetts providers listed there could not say how many translators they have or when they are available. The SAMHSA site is available only in English, with Spanish-language translators available only by phone. At Casa Esperanza, 100 men are waiting for a spot in the male residential program, so recovery coach Richard Lopez spends a lot of time on the phone trying to get clients into a program he thinks has at least one translator. After battling with voicemail, said Lopez, he’ll eventually get a call back; the agent typically offers to put Lopez’s client on another waiting list. That frustrates him. Casa Esperanza Executive Director Emily Stewart said Massachusetts needs a public information campaign via Spanish-language media that explains treatment options. She’d like that to include medication-assisted treatment, which she said is not well understood. Some research shows Latino drug users are less likely than others to have access to or use the addiction treatment medicines, methadone and buprenorphine. One study shows that may be shifting. But, Latinos with experience in the field said, access to buprenorphine (which is also known by the brand name Suboxone) is limited because there are few Spanish-speaking doctors who prescribe it. It’s a machismo thing, said Lopez. Santiago said not everyone feels that way. A few men called EMTs to help revive him. “I wouldn’t be here today if it wasn’t for them,” he said. But Santiago and others say there’s growing fear among Latinos they know of asking anyone perceived as a government agent for help — especially if the person who needs the help is not a U.S. citizen. “They fear if they get involved they’re going to get deported,” said Felito Diaz, 41. Bermudez said Latina women have their own reasons to worry about calling 911 if a boyfriend or husband has stopped breathing. “If they are in a relationship and trying to protect someone, they might hesitate as well,” said Bermudez, if the man would face arrest and possible jail time. Another reason some Latino drug users said they’ve been hit especially hard by this epidemic: A 2017 DEA report on drug trafficking noted that Mexican cartels control much of the illegal drug distribution in the United States, selling the drugs through a network of local gangs and small-scale dealers. In the Northeast, Dominican drug dealers tend to predominate. Kaiser Health News and NPR agreed not to use Rafael’s last name because he uses illegal drugs. Some Spanish-speaking drug users in the Boston area said they get discounts on the first, most potent cut. Social connection matters, they said. “Of course, I would feel more comfortable selling to a Latino if I was a drug dealer than a Caucasian or any other, because I know how to relate and get that money off them,” said Lopez. The social networks of drug use create another layer of challenges for some Latinos, said Dr. Chinazo Cunningham, who treats many patients from Puerto Rico. She primarily works at a clinic affiliated with the Montefiore Medical Center in the Bronx, in New York City. “The family is such an important unit — it’s difficult, if there is substance use within the family, for people to stop using opioids,” Cunningham said. In Massachusetts, four times as many Latinos live below the poverty line as do whites. The majority of Casa Esperanza clients were recently homeless. The wait time for one of the agency’s 37 individual or family housing units ranges from a year to a decade. “If you’ve done all the work of getting somebody stabilized and then they leave and don’t have a stable place to go, you’re right back where you started,” said Casa Esperanza’s Stewart. Cunningham said the Latino community has been dealing with opioid addiction for decades and it is one reason for the group’s relatively high incarceration rate. 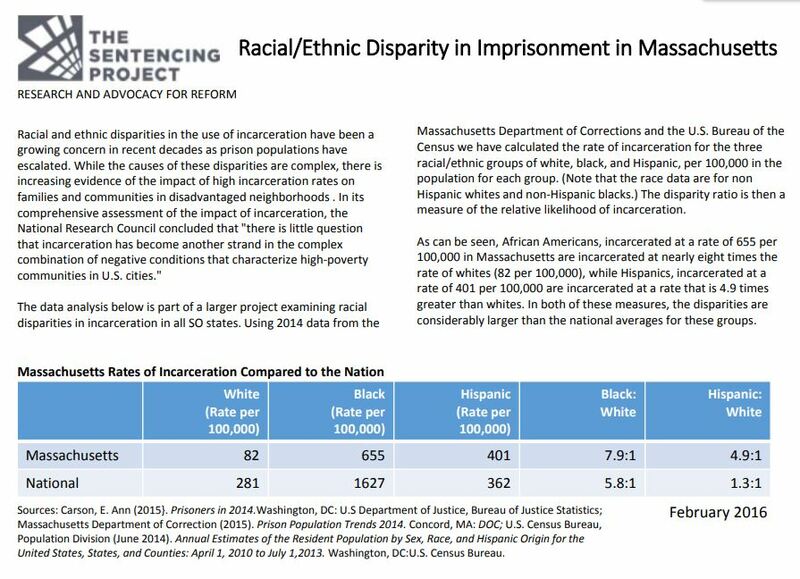 In Massachusetts, Latinos are sentenced to prison at nearly five times the rate of whites. Nationally, says the CDC’s Anderson, there’s no sign that the surge of overdose deaths is abating in any population. The fatality counts for 2017 are expected out by the end of this year. This story is part of a partnership that includes WBUR, NPR and Kaiser Health News, an editorially independent program of the Kaiser Family Foundation.